On September 26, 2018 the Laboratory Research and Innovation Group (LRIG) hosted an event called Better Assay Models at the South San Francisco Conference Center. A host of speakers discussed how advances in in vivo, in vitro and ex vivo assay models are producing better data and enabling key decisions to be made earlier and earlier. In particular, Genentech scientist Robert Blake, D Phil, gave a presentation titled Comparison of 3D Technologies and Their Applications to a Cancer Immunology Model. (See below for full abstract.) Cypre’s Symphony® and VersaGel® 3D culture platform was one of the technologies Dr. Blake discussed in his talk. We here at Cypre were excited to see the positive results he presented. 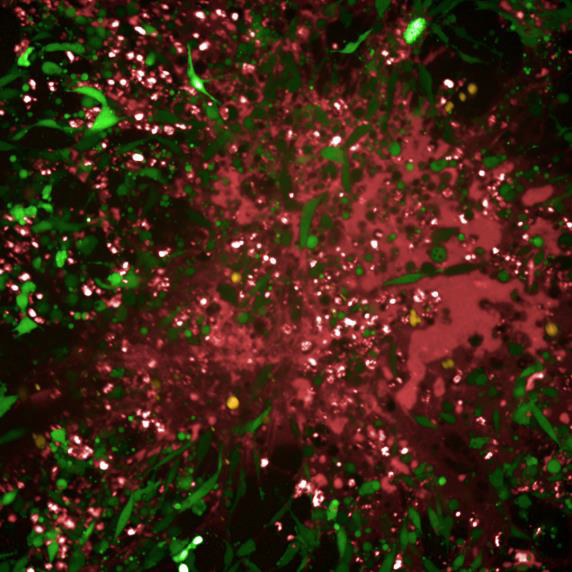 T cells (orange) infiltrating in VersaGel®-Immunology with GFP-tumors embedded inside (green), highlighting tumor cell killing (red). In the study referenced in Dr. Blake’s presentation, Genentech collaborated with Cypre to build a 3D tumor model showcasing immune cell exclusion, a hallmark of some cancers that has resulted in immunotherapy failures costing $Billions in R&D. Dr. Blake described how Cypre helped them build their 3D tumor model using the VersaGel/Symphony platform, and specifically how they created the tumor, stromal and immune cell components in a 3D fashion in 24-well and 96-well microplates. Dr. Blake’s presentation discussed how it was found that VersaGel’s stiffness and degradability of the matrix played an important role in tumor growth and T-cell migration. Moreover, the fibrotic layer incorporated into the 3D cell model provided a structural barrier to limit T-cell penetration to the surface region of the tumor, effectively recapitulating their clinical observations recently published in Nature. Without the barrier, T cells were able to more freely penetrate the tumor in VersaGel, suggesting the stromal layer provided chemical and/or physical cues attenuating T-cell response and killing of the tumor cells. Genentech will now explore testing various therapeutics in this 3D immune exclusion model for their ability to influence T-cell function. Contact us to learn more about how Symphony and VersaGel can deliver next generation 3D culture to your lab.